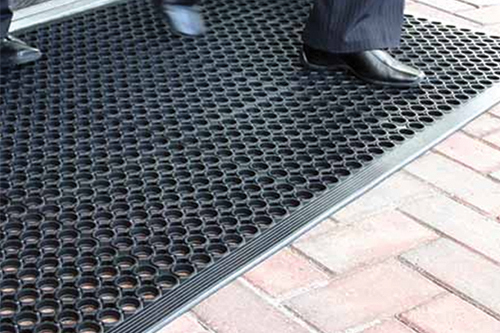 RAMP mat is very popular general purpose mat. The mat is available in black color. The mat is ideal for kitchen, food preparation area or any other area where oil may splash or splatter on the floor. This rubber mat provides basic comfort. Molded beveled edges on all 4 sides allow easy cart access. The grease resistant mat is designed to yield long service life. The slip resistant surface, large drainage holes and raised studs provide makes this a very popular and good rubber mat.